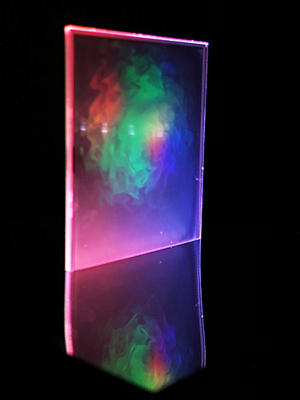 Japan Display Inc. (JDI) today announced that it will be exhibiting an illumination product, utilizing transparent LCD, at the opening exhibition in the product gallery called ※1 "FICTION", in "THROUGH - The Future of Visualization -", being held on December 6th, 2018, in Chelsea New York. The illumination product on exhibit, as part of the "JDI Future Trip Project", being produced by Sensingnet Inc. (CEO Momoko Tomizuka/hereinafter "SN") ※2, is something that was created jointly with a visual artist. Along with the 36 transparent LCD set up, so that it appears that light is being lit up from nowhere, and by the movie being projected on a large screen wall, that is 25 meters wide, it creates a fantastic atmosphere interactive inspirational art, using sound and images, communicating sensual information to the senses, creating a visualization of the weather in Tokyo and New York. In "THROUGH - The Future of Visualization -" (12/6 through 12/23), along with exhibiting the illumination product utilizing transparent LCD, we are seeking new value for transparent LCD, in an open innovation environment, holding brainstorming for students majoring in design engineering in New York, and young creators in the design and construction segments etc. Moreover, the illumination product announced this time is scheduled to be presented at both the CES※3, being held in Las Vegas in January 2019, as well as the International Contemporary Furniture Fair (ICFF) ※4, to be held in New York in May 2019. FICTION has the slogan of "Making Fiction Reality", being a cross culture between advanced technology and design art, promoting technology, still under development, that has yet to reach the market, being a place to create new value. Through open innovation, we will provide an interactive space, allowing all users, both creators and users, to participate. In the totally white roughly 3500sqf of space, there is a space for projection mapping roughly 3 meters high, by 27 meters wide. SN has locations in both Japan and the US, utilizing advanced technology and design, with the keywords being Community/Education/Innovation, as a design consulting company, creating new value and market. Through development etc. of unique microcomputer board sensors or products, seeking an expansion of human senses and our lifestyles, we are working on educational activities for the next generation. Also, by holding international symposiums etc., we seek merging of technology and design, supporting her creation of a design and engineering community.